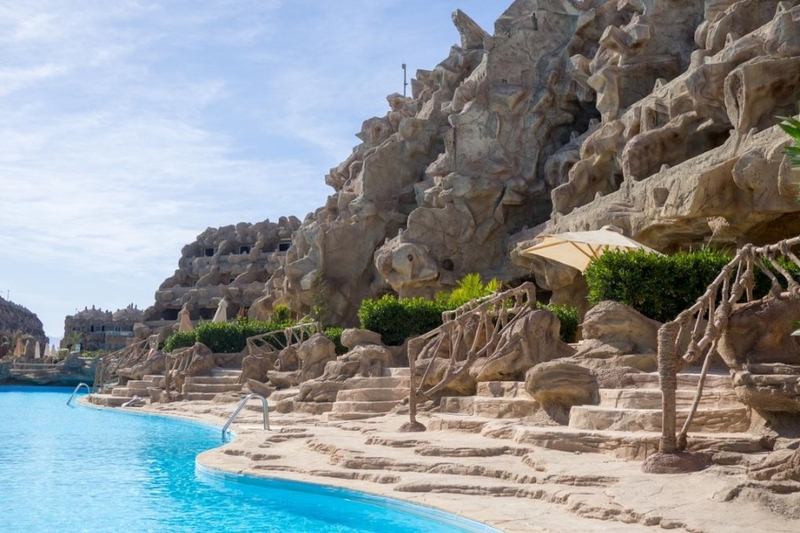 Offering an outdoor pool and a stunning private beach area, Caves Beach Resort is an inimitable property for adults-only on the gorgeous Red Sea Riviera. With cave style rooms, you can release your inner Flintstone on this red hot holiday. Transform your beach break into a holiday of a lifetime by adding a Nile Cruise and a trip to Cairo to see the Pyramids! Welcome to Caves Beach Resort Hurghada in Hurghada North. The hotel is located merely 50m from the private sandy beach. The closest cities to the hotel are El Gouna (8 km) and Hurghada (15 km). To make your stay more comfortable a mini market, a reception, air conditioning, shops, a lobby, a conference room and a hairdresser are available. The staff in this 4 storey hotel speaks French, Russian, German, Arabic and English. 3 fresh water swimming pools are available. Guests can unwind with a drink at the poolside bar. Sunshades and sunbeds are available free of charge at the beach and at the pool. Welcome to Caves Beach Resort Hurghada. The Caves Beach Resort Hurghada is located directly on a huge golden private sandy beach. The closest cities to the hotel are El Gouna (8km) and Hurghada (15km). To make your stay more comfortable a mini market, a reception, air conditioning, shops, a lobby, a conference room and a hairdresser are available. The staff in this 4 storey hotel speaks French, Russian, German, Arabic and English. 3 fresh water swimming pools are available. Guests can unwind with a drink at the poolside bar. Sunshades and sunbeds are available free of charge at the beach and at the pool. The Hotel is located 10km north Hurghada and 15km away from the airport and 10km from the ‘Venice of Egypt’, El Gouna. The Hotel’s exterior design is in a unique and wonderful Stone-Rock-Mountain Style same the Landscape, pool areas with integrated lights and plants around the pool and in all public areas throughout 40,000m² of landscaped area, various of water falls and lighting to enjoy the charm of the place. All the Caves are also fully cave-style in a high quality finish and made in wood and rock. The Hotel will make for a memorable stay that will keep you returning year after year… or at least once… maybe…:) Just kidding, you are always welcome here! The hotel has one restaurant. Evenings can be spent at the lobby bar. All-Inclusive: All-Inclusive includes coffee and tea (Service Hours: 15:30 – 17:00), local spirits (Service Hours: 10:00 – 23:00), snacks (Service Hours: 15:30 – 17:00), wine, beer, late breakfast (Service Hours: 10:30 – 12:00) and softdrinks (Service Hours: 10:00 – 23:00). There are several bars including beach, terrace, lobby and pool bars. There is also a disco on site for guests enjoyment. There are various dining options available to guests with a main buffet restaurant, beach restaurant and pool restaurant. The accommodation consists of a total of 360 cave style guest rooms with standard pool caves, standard sea view, deluxe sea view and royal pool & sea caves. Each ‘cave’ benefits from air conditioning, safe, tea & coffee making facilities, telephone, Internet access, satellite TV and a balcony or terrace. The royal pool & sea caves offer direct access to the pool. Sports and leisure facilities include 3 outdoor swimming pools, sun terrace with loungers, animation programme, fitness facilities and spa. There is also a diving centre, tennis courts, beach volley ball, table tennis, billiards and squash court. Beach towels and umbrellas are also provided for guests.